Dandelion's roots have a long history in traditional medicine as an all-around digestive aid and are also thought to be a fantastic natural diuretic, fine blood cleanser and excellent tonic that can help detoxify the system, especially the liver, spleen, and gallbladder. Dandelion may stimulate a poor appetite, making this herb beneficial in cases of malnourishment and frailty. Dandelions are rich sources of vitamins, minerals, and other antioxidant phytochemicals. The roots may assist in digestion and soothe an upset stomach. Dandelion root extract may help to regulate blood sugar, as a treatment for anemia and to keep your cholesterol in check. Research has shown that Dandelion root tinctures may show promise in the fight against cancers. This herbal extract should be added this to your herbal regimen for an overall feeling of good health and improved mobility. Dandelion root has also been recommended for tinnitus, tonsillitis, pneumonia, bronchitis, osteoporosis, abscesses, heart health, mammary tumors, and warts. Dandelion root extract may also be effective in eliminating or averting age spots. 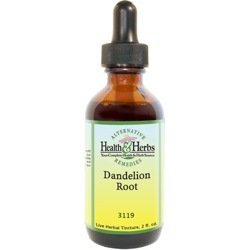 Another benefit of Dandelion root tincture is it eliminates the toxins in the body that cause other skin conditions such as psoriasis, eczema, and acne. It has also been found that Dandelion roots may help alleviate depression and fatigue caused by stress. It has great benefits for women who suffer from these conditions as a result of PMS. Dandelion Root is a potent natural diuretic (even compared to synthetic products) that increases urine flow, rids the body of excess water and helps to relieve bloated feelings. The high level of potassium is so important because large amounts are lost in the urine and too often flushed from the body when synthetic diuretics are used. This is has been used effectively for treating health problems associated with urinary tract infections. It also helps to keep the bloating and water retention levels down, effective in losing weight. Dandelion is said to help promote healthy heart function. The potassium works with sodium to regulate the body's water balance and normalize heart rhythms. It may lower cholesterol and triglycerides, as well as high blood pressure due to its diuretic action in ridding the body of excess fluid, thereby reducing the amount of fluid the heart must pump to circulate blood. Because of its high zinc and iron content, and it is often used to treat anemia. Dandelion Root and Leaves are known for keeping the internal organs clean and clear and is considered a great liver tonic that is said to promote healthy gallbladder, pancreas, and spleen function. This herb is effective in promoting the flow of bile and may ease such conditions as hepatitis, inflammation of the liver, jaundice and liver enlargement. By promoting the flow of bile, it is said to be helpful when used in the first stages of cirrhosis of the liver. Herbalists use this herb to treat kidney ailments, and it is also thought to improve gallbladder function, possibly even preventing gallstones. As a blood purifier, Dandelion Leaf is considered an excellent tonic that cleanses poisons from the body. Through its action both on the liver and kidneys, it gently eliminates toxic wastes from the body. The powerful blood purifying and liver cleansing properties help to clear skin problems, especially acne and psoriasis. A liver that is not performing adequately can worsen acne because it cannot break down and clear excess hormones from the body. Free radicals are known to wreak havoc on cells, the most common effect being the conversion of normal cells into cancer cells. Dandelion root preparations have been found to have significant amounts of antioxidants that have been scientifically proven to eliminate free radical activity. A Japanese study demonstrated that ingredients found in Dandelions inhibited tumor growth in animal studies on skin cancer. Another study showed that its prowess against breast and prostate cancer caused a decrease in breast cancer cell growth and proliferation and to block prostate cancer invasion. Research suggests the Dandelion root may improve the health and function of natural bacteria in the gastrointestinal tract. The root is a mild laxative that promotes digestion and is also used as an appetite stimulant and to improve upset stomachs such as flatulence, feelings of fullness and constipation. The root is believed to increase the stomach function, and the gallbladder can especially benefit from this supplement, it can even keep gallstones from forming and may help to dissolve any that are present. Dandelion root extract has been found to have anti-inflammatory properties that are particularly useful for those suffering from rheumatoid arthritis and help to keep it effectively under control. They can also reduce swelling and improve the pain that can accompany muscle spasms. A rich source of calcium, silicon, and boron it may be helpful in cases of osteoporosis. Dandelion's benefits extend to the treatment of infection as well. Supplements of Dandelion roots are thought to be helpful in treating inflammatory skin conditions as well, including acne, psoriasis, and eczema. Ingredients: Dandelion Root, Structured Water, 20% Alcohol. Non-Alcohol: Dandelion Root, Structured Water, and Vegetable Glycerin. Contraindications: Pregnant and nursing women should not use Dandelion Leaf or Root. It is not recommended for people with gallstones or biliary tract (bile duct) obstruction without first consulting a physician. In cases of stomach ulcers, gastritis or irritable bowel, Dandelion should be used cautiously, as it may cause the production of excess stomach acid. Those who are allergic to daisies or asters should not use Dandelion. Do not take Dandelion without talking to your doctor first if you are taking certain medicines used to treat infection (antibiotics such as Cipro, Tequin, Levaquin, etc., as it may lower efficacy of drug); Potassium supplements for health condition (too much may be harmful); Blood thinning medicine (Coumadin, Plavix, aspirin, etc. ).